Spring beauty grows from a starchy rhizome, where it stores all the energy it made the previous season to fuel its early spring growth. The pink veins and yellow circle on the flower petals act as nectar guides for pollinators. Because those pollinators are generally out and about when the sun is shining, spring beauty only opens on sunny days. Some Native elders used this plant behavior as a barometer to predict oncoming storms. Distinguishing Features: Spring beauty is an herbaceous perennial in the Montiaceae family. This plant is a woodland perennial that produces small flowers in spring. 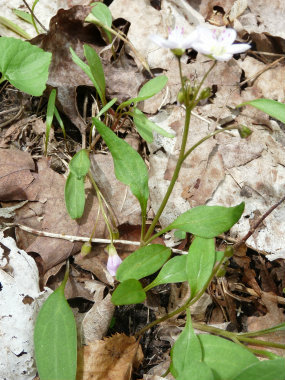 The petals are pink or white, with darker pink veins. The plant disappears from above the ground soon after the seed capsules have ripened. 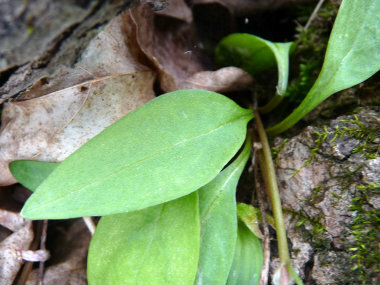 A similar plant, Claytonia virginica, has much narrower leaves. Flowers: White and pink flowers grow in terminal clusters. 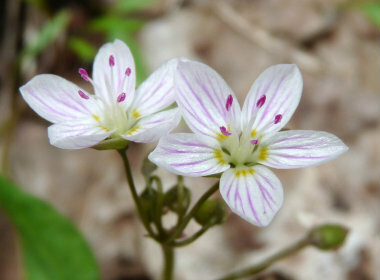 Each flower has six white petals streaked with pink veins. Each flower is 2cm wide (3/4”). The very bottom of each petal is tinged with yellow so that it looks like there is a faint yellow circle in the middle of each flower. Fields of Nutrition has medicinal benefits and vitamin/mineral content of Spring Beauty. Leaves: One pair of leaves are on the stem. The leaf and stalk are 3 to 8 times as long as wide with the stalk obviously being distinct from the wider leaf. 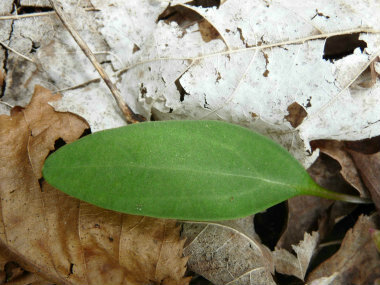 Each leaf is up to 8 cm long (3") and about 2cm (3/4") wide. Height: Spring beauty can grow to 12cm (5”) tall. 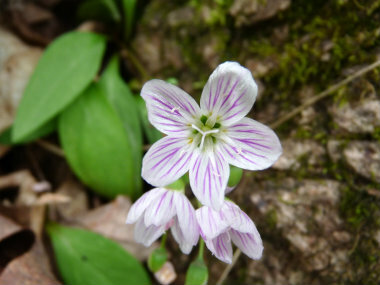 Habitat: This plant can be found in rich open woods, forests, alluvial thickets and in some wetlands. They are found primarily from Ontario to the east and in eastern USA. Edible parts: The root can be consumed raw or cooked like potatoes. They are rich in starch; it has a pleasant nutty flavour. Leaves and stems can be eaten raw or cooked; they have a mild flavour. 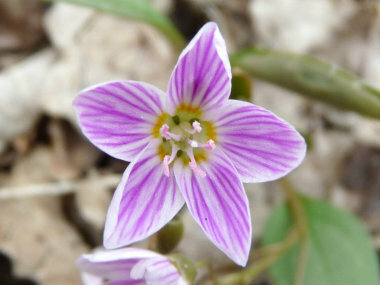 Similar plants: Virginia Spring Beauty.